Avert your eyes if you don’t want to feel guilty about overindulging on Thanksgiving! Victoria and David Beckham are absolutely stunning together on the December/January cover of Vogue Paris. The gorgeous couple struck a tender pose for photographers Inez van Lamsweerde and Vinoodh Matadin and the results were so gorge that the magazine made two special covers for the issue. And Beckham isn’t just the cover model. She also served as the December issue’s guest editor of the esteemed magazine, which gives the mother-of-four’s fans a sneak peek into her glamorous life, from behind-the-scenes at her Spring/Summer fashion show to tea time with her chic friends Marc Jacobs and Valentino Garavani. Of course, her gorgeous hubby was at her side the entire time she worked on the issue, the magazine notes. And because it’s the Christmas issue, Beckham, 39, will share personal holiday memories, including family photos and some of her children’s drawings. David Beckham has been an ambassador for the London Games since the committee launched its bid in 2005. He was Britain’s first torch bearer, taking the flame after its flight from Greece. Now all he wants to do is take part. In Monday’s interview with Today’s Meredith Vieira, he reiterated his wish to play on Britain’s Olympic Soccer team this summer. “I’ve played for the national team for quite a few years and now I want to represent the GB team in the Olympics,” Beckham told Vieira. Britain hasn’t sent a soccer team to the Olympics since 1960, mainly due to each of the United Kingdom’s countries maintaining separate national programs. As the host country of the Olympics, it is granted entry in every sport. The Olympics are traditionally a U-23 tournament, but each team is allowed three players over the age of 23. If Beckham, 37, is selected, nearly the entire team will be over a decade younger than him. 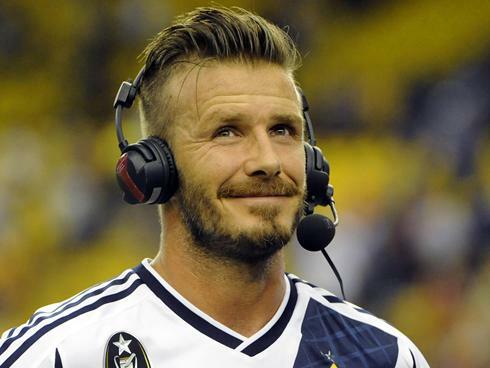 Beckham has already faced criticism that his selection would come not because of his skill but because of his celebrity. Beckham also voiced his opinion that he thinks an Olympian should light the cauldron to end the opening ceremony but added, “it would be tough to say no” if asked. Paul McCartney confirmed Monday he will be the closing act of the opening ceremony. David Beckham visits Loyal Studios to work on a video production.